United Launch Alliance (ULA) and Ball Aerospace will celebrate the 10th anniversary of hands-on STEM education with a rocket launch over southeastern Colorado. 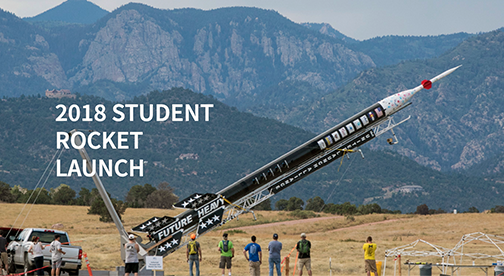 Open to the general public, the 2018 Student Rocket Launch will be held on July 14 at Lake Meredith, Colorado, and marks the culmination of work by students from kindergarten through graduate school. Since 2008, ULA’s summer interns built and launched high-power sport rockets carrying payloads (onboard objects, experiments or instruments that may deploy from the rocket) designed and built by Ball Aerospace interns as part of the Ball Intern Remote Sensing Team (BIRST) program. In 2010, ULA opened the opportunity up to K-12 student teams, and the program has grown substantially. ULA and Ball interns volunteer to participate in the program in addition to their “day jobs” at the aerospace companies. This year, ULA’s Future Heavy SS rocket — short for “Future Heavy Super Sport” — will launch 36 payloads, with 15 competing to win as much as $5,000 by designing a craft to return to a pre-appointed location near the launch. A payload can be almost anything a team can create within the provided guidelines. Tory Bruno, ULA president and CEO, said that the company started this program because ULA wanted their interns to have this hands-on opportunity, and the firm hase worked with Ball Aerospace to continue expanding its reach to encompass students from kindergarten through graduate school. ULA is always focused on mission success, and in this case, we want to inspire the next generation to pursue careers in the space industry and encourage their passion for this cool industry. Rob Strain, President of Ball Aerospace, said the company's BIRST program and the ULA rocket launch offer the firm's interns a unique real-world opportunity to collaborate with mentors to bring a design idea from concept to launch. The Ball interns represent a diverse group of students from 42 universities who are pursuing careers in STEM fields, which are critical to the aerospace industry in the U.S. as well as Ball's local Colorado community. The 2018 Student Rocket Launch is free and open to the public. In addition to the Future Heavy SS, four other high-power sport rockets will launch. Visit www.ulalaunch.com/explore/intern-rockets/student-rocket-next-launch for more information.